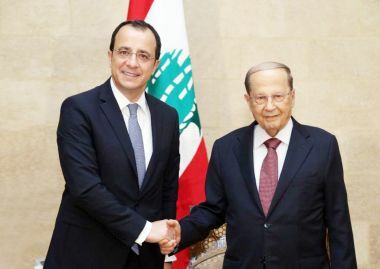 Lebanon - - President Michel Aoun met at Baabda palace Wednesday with Foreign Minister of Cyprus, Nikos Christodoulides, with whom he discussed the means to activate bilateral cooperation and tourism ties. During the meeting, Christodoulides delivered to his host an invitation from the Cypriot President to visit Cyprus and hold a tripartite presidential summit that involves Lebanon, Greece and Cyprus. He also maintained that Cyprus was looking forward to enhancing cooperation and coordination with Lebanon in various fields, as well as to activating ties between the Lebanese and Cypriot businessmen. "During the European Union meetings, Cyprus always calls for helping Lebanon to enable it to withstand the current challenges, especially in terms of the Syrian refugee crisis. For his part, President Aoun maintained that Lebanon, Cyprus and Greece shared interest at different levels, particularly in terms of backing Lebanon's endeavors to repatriate the displaced Syrians to the safe areas in Syria. He also highlighted the necessity of the EU role in speeding up the sought political solution to the crisis next door. Moreover, he put emphasis on the importance of coordination between Lebanon and Cyprus at the security level, especially to control the maritime routes which terrorists might use to flee Syria after their defeat. It is to note that Christodoulides came accompanied by Cypriot Ambassador to Lebanon Christina Rafti, Director of the Middle East and North Africa Division at the Cypriot Foreign Ministry Andreas Kakouris, and a number of diplomats. Aoun had separately met with Deputy House Speaker Elie Ferzli and MP Farid Bustani. 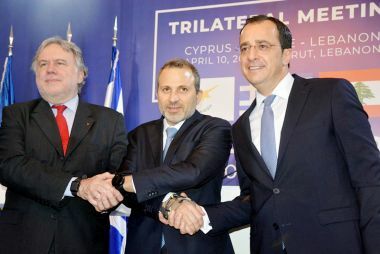 Lebanon - Foreign Minister Gebran Bassil announced after the tripartite meeting he held with his Greek and Cypriot counterparts, Nikos Christodoulides and Georgios Katrougalos, the launch of the tripartite route between Lebanon, Cyprus and Greece. "We have confirmed Lebanon's commitment to Resolution 1701 and rejected the US decision on the Golan Heights," Bassil said. He stressed that Lebanon and its neighbors should not remain without political and economic coordination. "At the top of the political agenda was the return of Syrian refugees. Lebanon should not have to bear the repercussions of the solution. The international community ought to shoulder its responsibilities. We have indeed heard a very advanced position from Cyprus and Greece on the subject of displaced persons." "A safe and dignified return of the displaced has become imperative. We are at the threshold of a new stage and everyone has to deal with the present status quo," Bassil said, stressing that "Lebanon cannot for long keep closing the gaps through which Syrian refugees are infiltrating into Europe." "We have set a deadline on May 7 to finalize the agreements between Lebanon, Cyprus and Greece in the fields of tourism, trade, investment and cultural cooperation. Subsequently, we will move on to a trilateral summit in Cyprus between the three presidents to sign said agreements," he said. For his part, the Cypriot Foreign Minister said: "We dealt with the problems in the region and assured our full cooperation in what Lebanon needs." "Our first objective is to strengthen the means of communication and dialogue in the Mediterranean region," the Greek FM noted.